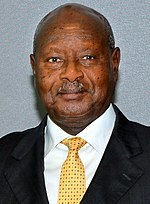 Yoweri Kaguta Museveni (natus fortasse apud Ntungamoni in Uganda circa 1944), e populo Banyankole ortus, alumnus Universitatis Daressalaamensis, est a die 19 Ianuarii 1986 praeses Ugandae. Yoweri Museveni. 1997. Sowing the Mustard Seed: The Struggle for Freedom and Democracy in Uganda. Macmillan Education. ISBN 0-333-64234-1. Yoweri Museveni. 2000. What Is Africa's Problem? University of Minnesota Press. ISBN 0-8166-3278-2. Ori Amaza Ondoga. Museveni's Long March from Guerrilla to Statesman. Fountain Publishers. ISBN 9970-02-135-4. Joshua B. Rubongoya. 2007. Regime Hegemony in Museveni's Uganda: Pax Musevenica. Novi Eboraci: Palgrave MacMillan. Novissima mutatio die 4 Octobris 2015 hora 13:39 facta.